As technology has become more prevalent and pervasive in society, City, University of London is at the forefront of using such tools to teach students. 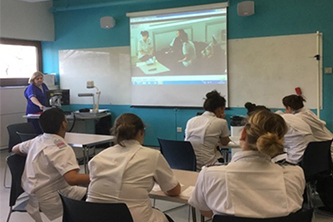 Nursing in particular can benefit greatly from such simulation environments, and researchers and staff in the School of Health Sciences at City have been using such facilities to add a realistic dimension to the learning process while also enhancing student engagement. One innovation is the simulation suits project, which used the City TECS, a purpose built learning hub which simulates a studio flat, as an environment to simulate nursing in a community setting. This added a real-world dimension to the learning process and enhanced student engagement while also preparing them for professional practice in an immersive learning environment. The project was praised at the annual 2016 Health Has Got Talent awards at City, winning the silver prize. In the project both older adult and bariatric empathy suits were used to show students the issues older and obese patients may face, and enabled them to discuss the challenges of managing care in the community. We had the idea of using the flat in a simulation exercise whereby the students gain experience of nursing patients in their own home. The nursing curriculum commenced in 2012 and it was the first time that dedicated simulated practice was planned and integrated into the curriculum. Our regulating body in the UK, Nursing & Midwifery Council, stipulate that up to 300 hours of practice time can be used as simulated practice hours, and the new facilities at City provided a great opportunity. Using City TECS enables students to learn in a superb environment. Equipped with latest telehealth, telecare and telemedicine the space is used to simulate community nursing activity and also has live and recorded video streams available for students and staff. As a result the space provides experiential learning in an immersive learning environment, while offering reflective practice. Many will not be familiar with the suits but they are very useful for experiential learning. The bariatric suit, whilst weighing under 10Kg, visually simulates morbid obesity while the older age suit simulates stiffness of the joints, muscle weakness and sensory impairment, although does not represent old age visually. Both are excellent tools when we’re training nurses of the future. By providing experiential learning while wearing the suits – as well as observing the situations as they unfold – the project is also an excellent example of an immersive learning environment as students were also asked to watch videos during the sessions in order for them to think about relevant issues and their perceptions before feeding back to the ‘actors’ who are immersed in the role play. This means that not only do those wearing the suit become engaged, but others gain the opportunity to discuss their experiences in practice and to give feedback. It also enables students to reflect on the positive aspects of their learning and the ‘lived experience’ of particular client groups, while also challenging perceptions and giving them an awareness of the psychological impact and links to relationship centred care. In City TECS itself, students undertake ‘simulation in practice’ scenarios based on the clinical skill or teaching/patient education required. Normally, for a community nursing simulation this would involve one student acting as registered community nurse and one as a patient. Students in classroom are then given an observation checklist to focus their observations and guide feedback. This includes communication and interpersonal skills during interaction; risk assessment, teaching or clinical skill performance. “We have no ‘script’ as the students decide how the scenario plays out and we discuss the learning that flows from this. This way it provides clinical skills practice and patient education,” said Karen Rawlings-Anderson. Following the scenario, feedback is then obtained from the actors and observers, and extracts of videos used to prompt discussion. This enables lecturers to draw on student experience to discuss challenges of managing care in the community while also recognising achievements and preparing them for the professional role. So far, the projects has been a great success. "The project has really added a new dimension to the learning process- especially for those who have not been in the community setting before. It has also enabled us to make good use of the empathy suits and see how classmates interact with patients. Feedback has also been really positive, with 119 out of 120 students saying they gained additional insight when compared with a classroom-based session, with one student highlighting how it made them feel like they were actually a district nurse."